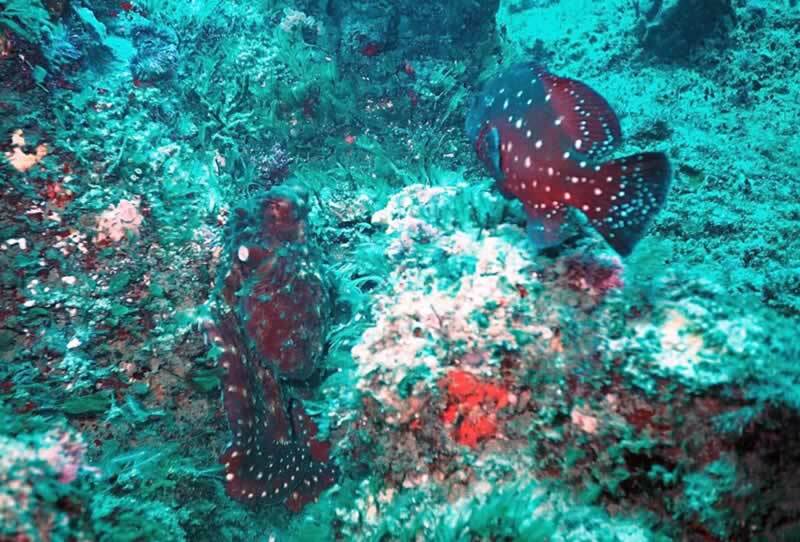 " We were diving on Anton's (on Two Mile) at Sodwana when we noticed the tomato rockcod harassing an octopus. The octopus was swimming freely and changing colour very rapidly to try to blend into the background. I took this photo and only realised on developing it how the octopus was mimicking the rockcod. Notice that it is taking on the shape of the tail as well as the colouring ". This photo is very interesting. It does indeed look like the octopus is mimicking the rockcod. I've never seen this before. It would have been great to get this on video and watch the interaction between the fish and octopus. Another WOW! photo. Well done! Many thanks David, for sharing your WOW! PHOTO. South African Institute for Aquatic Biodiversity or the respective photographer. All Rights Reserved.